My husband insisted for years that I needed to read C.S. Lewis’ Space Trilogy and he was absolutely correct. I did need to read them. Badly. This past winter, Amazon had a massive Kindle sale for the whole set of books and my husband alerted me to the reduced prices. I snatched them up. Unfortunately, I’d been so busy with other books that I didn’t get the chance to start reading C.S. Lewis’ adult sci-fi series until a few weeks ago. As soon as I started reading Out of the Silent Planet, knew I had picked up something of immense importance and worth. 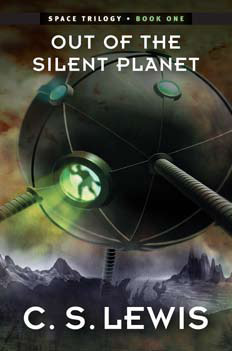 Out of the Silent Planet introduces Dr. Ransom and chronicles his abduction by a megalomaniacal physicist and his accomplice via space ship to the planet Malacandra. The two men are in need of a human sacrifice and Dr. Ransom would seem to fit the bill. Dr. Ransom escapes upon landing, though, and goes on the run, a stranger in a land that, like Jonathan Swift’s Lilliput, is enchanting in its difference from Earth and instructive in its similarity. Ransom is a careful, scholarly man who is very angry about being kidnapped and forced onto a space ship. However, because he is also a wise man, he has sense enough to know his fate is sealed and he approaches Malacandra (upon landing) with a mingled curiosity, wonder, and awe. A squabble arises after the three men arrive on the planet and by a twist of fate, Ransom ends up fleeing the others and seeking safety in a valley filled with strange vegetation and even stranger creatures. There he meets many wondrous beings and ends up being sent on a perilous journey. I am very much looking forward to diving into Perelandra, the sequel to Out of the Silent Planet. As soon as I finish Juliet Marillier’s Son of the Shadows, I’ll immediately jump in to the second of The Space Trilogy! ← Check Out What My March Sponsors Are Reading!